I currently live in an apartment, so it was a no-brainer for me that if I were to adopt a cat, it would be kept indoors. I did buy Delilah a cat leash that I'm looking forward to using more when the weather warms up, but this winter she's been an 100% indoor cat! I wouldn't feel comfortable letting her roam free outside of my apartment (nor do I even know if that's allowed in my lease). Since Delilah is an indoor cat, it's important to me that she gets good nutrition and exercise that will continue to keep her healthy and strong. The rescue that I adopted Delilah from had sent her home with a small bag of the food that they had been giving her, but she was really not a fan of it. During her first few days home, I was still mixing that original dry food in with different ones I was trying, and she wasn't eating very much. I knew that I had to find her a new dry food! I was making frequent trips to PetSmart when I first adopted Delilah (crazy how many pet items you don't know you need at first, and then suddenly you need them! ), and I was very impressed with their large selections of Purina® foods for cats. 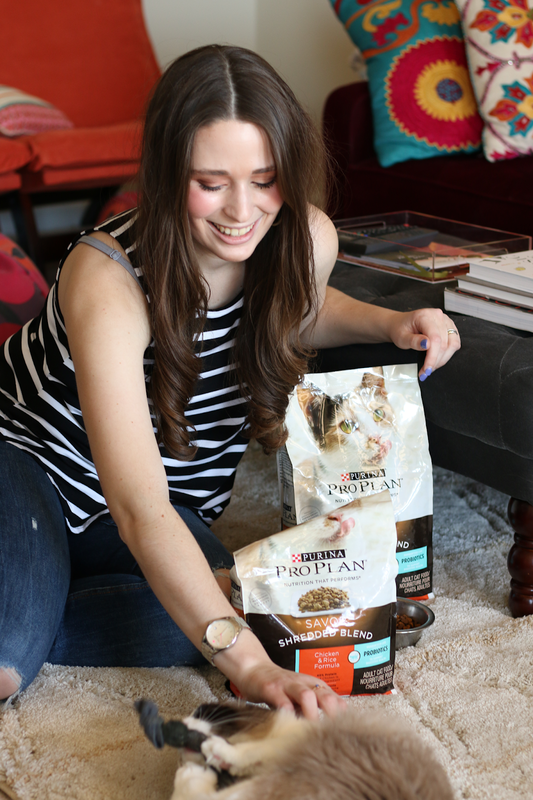 I decided to try Delilah on the Purina® Pro Plan® Savor® cat food, and she loved it from the first time she tried it! Why did I look into a Purina® food for Delilah? Because I trust them! My childhood cat (who lived to be 17!) at a type of Purina® food, and she was very healthy and agile well into her old age. Purina® has actually been fueling pets since 1986! 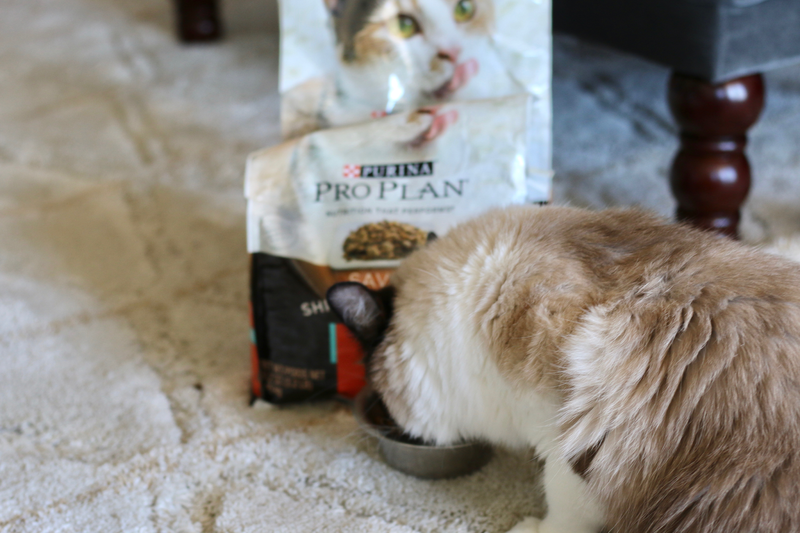 The Purina® Pro Plan® Savor® cat food has five dry formulas with guaranteed live probiotics to support your cat’s digestive health. And real protein is the #1 ingredient in all dry formulas! Purina® Pro Plan® Savor® is conveniently available at PetSmart! PetSmart has two locations in the Charlottesville area, and as I shared above I'd made quite a few trips there in the weeks after bringing Delilah home. 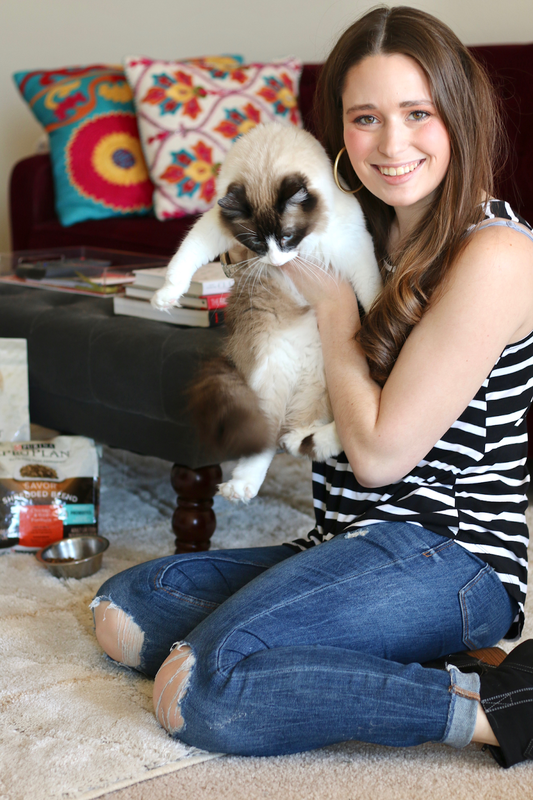 They have a wide range of Purina® Pro Plan® Savor® foods for both cats and dogs in the stores! Even better- right now if you buy Purina® Pro Plan® Savor® at PetSmart, you get $10 back in the form of a digital prepaid card. The offer (linked here) begins on 1/20/19 and runs through 2/28/19! Who doesn't love extra savings on their pet's food? Cuddle sesssions: Delilah isn't a huge lap cat yet (she's only two years old so still very playful), but I do have this one extra fuzzy bathrobe that she's crazy about! Sometimes when I want to sit down and watch a TV episode or two on the couch, I put on my fuzziest robe to encourage her to come cuddle with me- which is always great for both of us. Keeping toys fresh: I have some cat owner friends who complain that their cats never play with their actual toys- but Delilah is pretty good about enjoying her toys! She definitely plays favorites with a couple of them which is so cute. It is important though for me to keep her toy selection fresh so that she doesn't get bored of them! So many sweet friends bought me cat toys for Christmas this year since it was my first year as a cat mom. After Christmas, I let Delilah pick out a toy from the gifts pile that she wanted to play with then, and I put the rest away. Every couple months, I'm planning to take out a new one for her to keep her engaged in her toys! 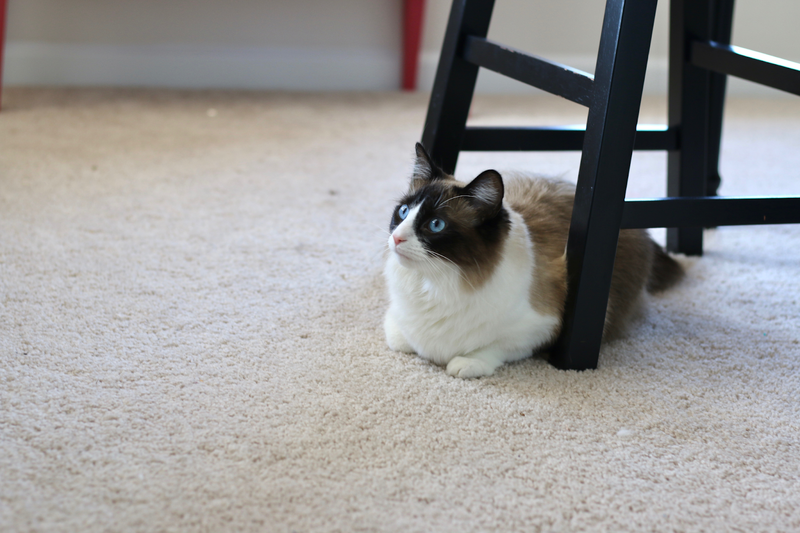 Be a host: I suppose this last tip applies more so to cats that are extroverts and love people, but fortunately that's Delilah! She is a friendly, happy girl and loves it when I have friends over! I've been trying to have people over at least a few times a month- either girlfriends for dinner or church friends on Sundays. She is always such a ham when there are new people around to play with her and talk to her. P.S. No new blog post on Monday as I'll be in NEW YORK (!!!) for Fashion Week, but stay tuned to my Instagram Stories and feed all weekend for updates! We feed Zuko the Pro Plan Weight Management and he loves it! Have SO MUCH FUN at NYFW!! Oh my goodness, how cute is this? We actually just bought this same food for our kitty and she loves it. I am going to share about it on Insta soon. I’m a cat mom too, to three rescues. They are so much fun and have such big personalities. Thanks for the food recommendation. I’ll check it out! Fun stimuli is so important for happy kitties! These are some great ideas! she is beautiful! I'm a cat mom to a Russian Blue we rescued!